Pete & Barb in Corpus were questioning whether this was a Coopers or a Sharp-Shinned Hawk. They really look close but I’m not sure what kind of bird this hawk is. If someone else has a comment, please share it. Just looked at Cornell’s Bird Site….Hard to tell but doesn’t look like the Cooper’s Hawk(chicken hawk) that was in my garage here in the Mountain State a couple of years ago.It had followed sparrow’s in then left when I entered in my car. Not much to go on in that photo, but the Sharp Shinned Hawk would typically have the dark gray on the top of its head running all the way down the back of its neck. 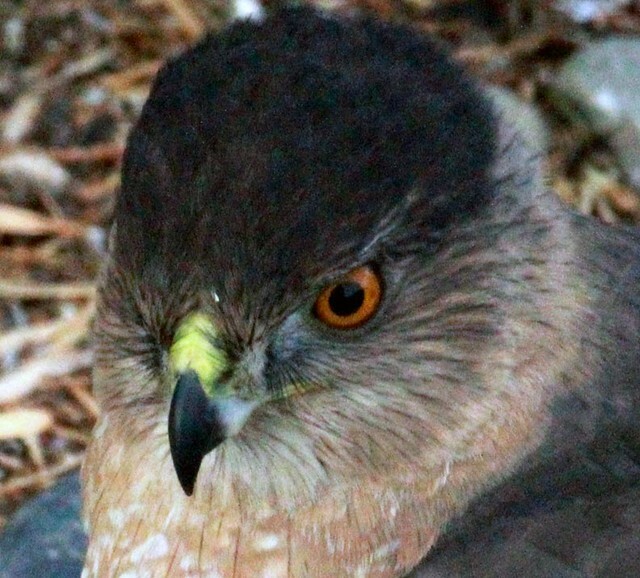 A Cooper’s Hawk would typically have dark gray on top of the head, light gray on the back of its neck, and dark gray again starting at the shoulders. Hard to tell for sure, but I’d guess a Cooper’s Hawk based on what we can see. Well, I’m no bird expert but, if I read the Peterson’e iPhone Bird App correctly, on a Sharp-Skinned Hawk’s head feathers are the same color as the back feathers and the tail has a straight banding across the underside. But, the Coopers Hawk has the darker head and a double chevron design in the end bands on the underside of the tail feathers. Of course, like I said earlier, I’m no expert and I just “Tried to find the 5 differences between the two pictures”. Thanks everyone, for the comments. It’s fun to watch this bird no matter what kind of hawk it is.